Mashed potatoes are good, but these smashers are good and fun! 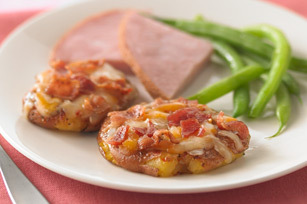 They're skillet simple and topped with sharp Cheddar and bacon. Save 40 calories and 4 grams fat per serving by preparing with KRAFT Light Zesty Italian Dressing, KRAFT 2% Milk Shredded Sharp Cheddar Cheese and OSCAR MAYER Turkey Bacon. Serve with BREAKSTONE'S Reduced Fat or KNUDSEN Light Sour Cream. Garnish with chopped fresh chives just before serving. Do the busy work ahead of time. Cook and flatten potatoes as directed; cool. Refrigerate up to 24 hours before cooking as directed.